Asics Gel Kayano 24 are stability cushioned running shoes. The Asics Gel Kayano 24 is a new edition of the most popular premium running shoe with pronation support featuring great stability, plush cushioning and high price tag for superb comfort in long distances. Definitely good news to keep FlyteFoam™ midsole which means Asics has received good feedback from end users and not only the typical marketing hype. This foam is also used in its counterpart for neutral runners Nimbus 19. 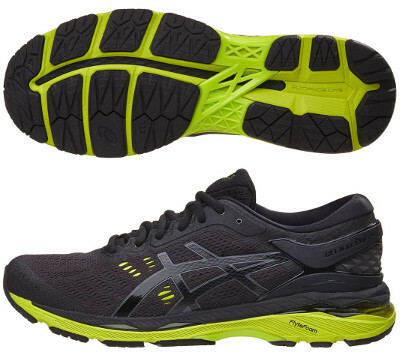 Major change compared to its predecessor Asics Gel Kayano 23 takes place in the upper with new heel counter already featured in innovative MetaRun which improves stability by better embracing the heel. Collar area has been redesigned with lower height to better protect the achilles. Dual layer upper fabric is plenty of ventilation holes to improve breathability and reduce friction while exposing support straps for snug fit. Rest of Kayano 24 remains untouched with a fimer layer (SpEVA) on top of midsole for better response and classical GEL® units embedded in both rear and forefoot to make landing more comfortable even on irregular terrains. As expected double density (Dynamic DuoMax®) foam is combined with mentioned FlyteFoam™ in midsole for progressive pronation support. Stability is also backed on quoted heel counter (MetaClutch™) and typical plastic piece in midsole (Trusstic System®) which adds valued stiffness. Outsole keeps typical vertical flex groove (Guidance Line®) for smoother ride and offers different rubber depending on the area with DuraSponge in the forefoot and AHAR+ in more exposed ones to increase durability.